A good size rectangular document box in jichimu, each panel joined by a row of small dovetail joints. The front panel has a yellow brass foliate lock plate with a hinged clasp in the form of a ruyi. The sides are fitted with shaped bail handles. At the back, two yellow brass strap hinges hold the cover in place. 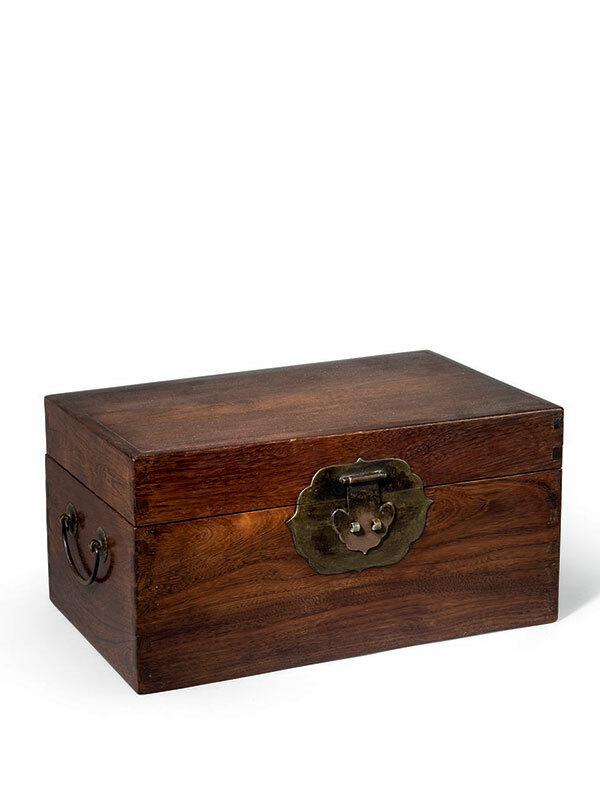 This large document box shows the delicacy of traditional wood craftsmanship in China. The employment of exposed dovetail joints on the corners is unusual. Jichimu, literally meaning ‘chicken-wing wood’, derives its name from its characteristic feathery grain. Judging by the size of this box, it would have been suitable for documents such as hand scrolls. A slightly smaller jichimu document box with closely comparable exposed dovetail joints and foliate lock plate, but with the sides of top and bottom linked by an external brass trellis hinge mechanism, is dated to the late 17th – early 18th century and illustrated in Wood from the Scholar’s Table: Chinese Hardwood Carvings and Scholar’s Articles. 1 Two further comparable document boxes of similar proportions and with exposed dovetail joints, but made of huanghuali and decorated with beaded edges, are dated earlier to the 17th century: one is in the Lu Ming Shi collection,2 the other is in the Piccus collection.